Registration for all the camps will open on May 1, 2019. 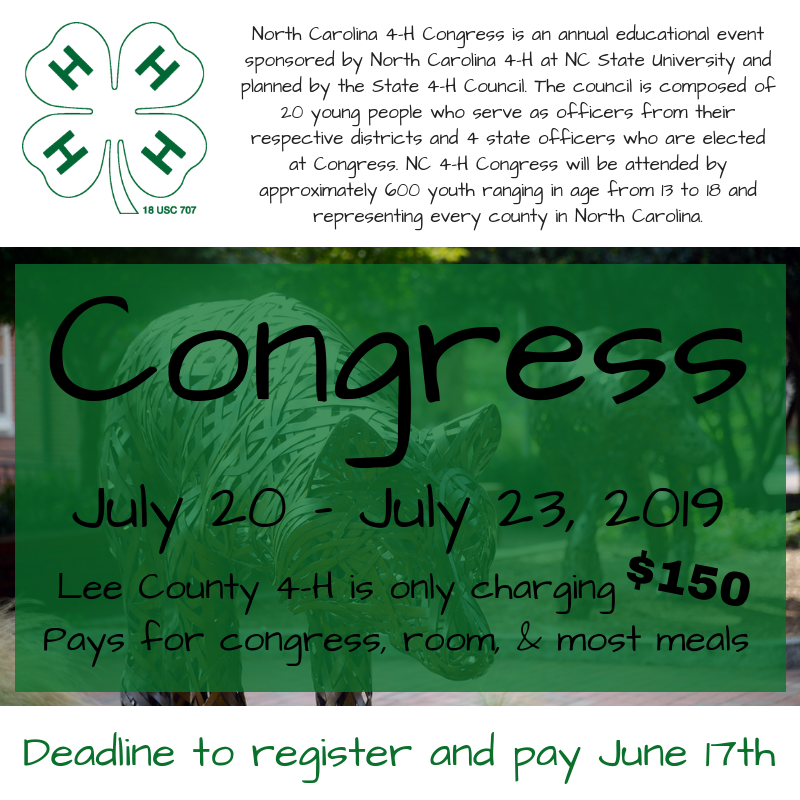 Prior to that you may go ahead and enroll in Lee County 4-H at 4honline.com so you will have easy access to the registration menu on May 1. Register by May 15 to guarantee your T-Shirt. Thank you for your continued interest in the Lee County 4-H summer day camp program. Registration is done online for your convenience. Please call us if you have any problems with online registration at 919-775-5624. 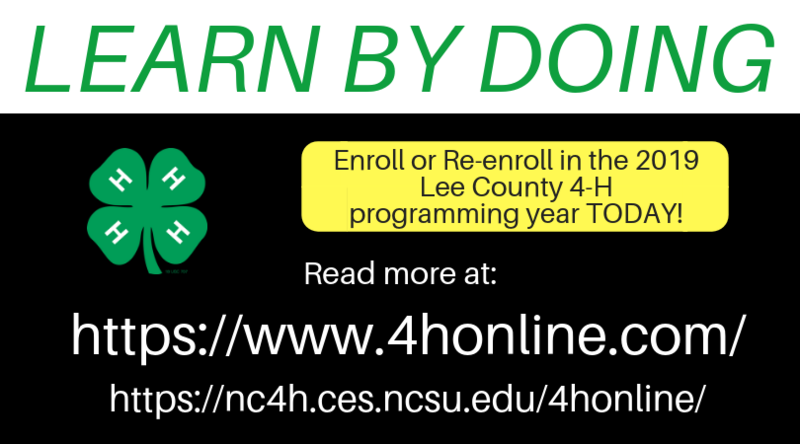 You must enroll with Lee County 4-H at 4honline.com (you can do this today) and register your class choices on May 1st. If you are not currently enrolled you can begin today by going to 4honline.com. Choose “Lee County 4-H Summer STEAM” as your club. Here’s a helpful document to have in hand when beginning the online enrollment process. Once you have enrolled at 4HOnline and signed-up up for your class(es) you will receive an invoice. Bring this invoice to extension (Monday-Friday, 9 a.m.–1 p.m. and 2–4 p.m. to 2420 Tramway Road, Sanford) by the deadline to pay and secure your spot in the class(es). The invoice and exact change or check are required to complete the Summer STEAM registration process. ALL SUMMER STEAM FEES must be received (not postmarked) at the N.C. Cooperative Extension of Lee County office by the deadlines outlined in each description or you forfeit your child’s place in the class. You may place your child on a waiting list by emailing pkerley@ncsu.edu. All fees are NON-REFUNDABLE after the deadline unless an activity is canceled. If you are paying in CASH please BRING THE CORRECT AMOUNT Monday-Friday, 9 a.m.–1 p.m. and 2–4 p.m. to 2420 Tramway Road, Sanford. Your child’s birthday must fall on or before the registration deadline to be eligible for classes. All fees are non-refundable unless an activity is canceled. If the class that you would like to register your child for is FULL, please e-mail Pam Kerley at pkerley@ncsu.edu and ask to be put on a waiting list for that class. If your child is unable to attend a class after you sign up, please let us know so that other children may have the opportunity to participate. Contact Pam Kerley at 919-775-5624 or pkerley@ncsu.edu. All Lee County 4-H Summer STEAM events or activities are operating under the 4-H Code of Conduct and Disciplinary Procedure. The N.C. 4-H Code of Conduct and Disciplinary Procedure is a condition of participation in 4-H events/activities. If you do not have access to a computer to register for Lee County Summer STEAM online, you may come by the N.C. Cooperative Extension of Lee County office and we will provide computer access for you Monday-Friday, 9 a.m.–1 p.m. and 2–4 p.m. at 2420 Tramway Road, Sanford beginning May 1. Please note that we only provide you with computer access. We cannot register your child for you. PLEASE ARRIVE ON TIME AND BE PROMPT FOR PICK UP! For accommodations for persons with disabilities, contact Lee County 4-H at 919-775-5624, no less than seven business days before the event. • What Is the Extension Master Gardener Program in Lee County?